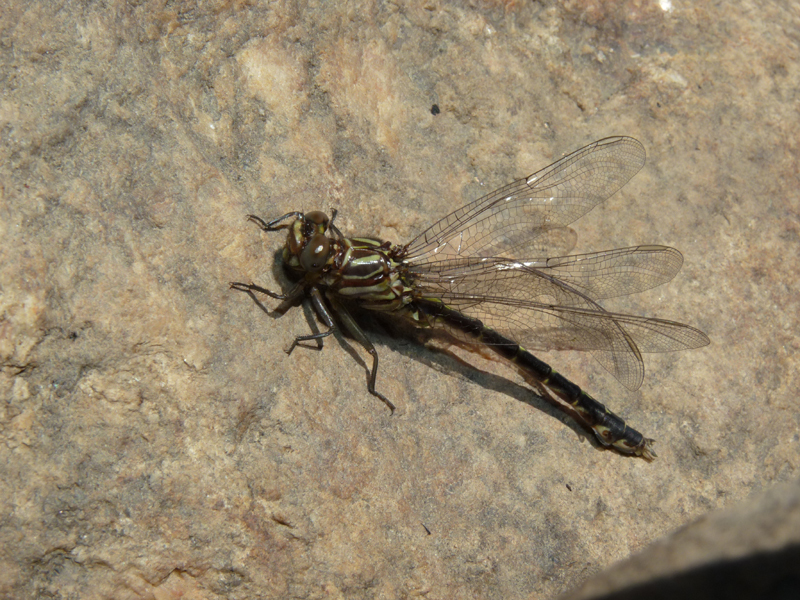 I just started a very exclusive club where all the members have seen Elusive Clubtail in Alberta. How many memberships have been given out? Just one... self high-five! 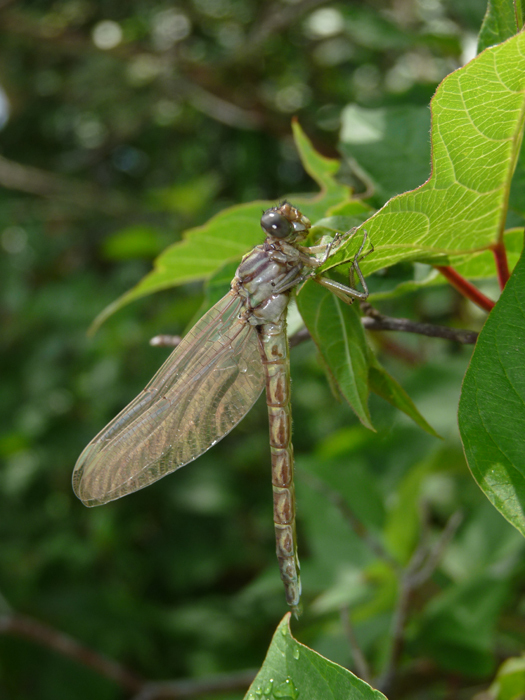 Before heading up to Fort McMurray earlier in the spring, I perused through Dennis Paulson's excellent "Dragonflies and Damselflies of the West" field guide to see if there was any potential to encounter odonates I had never seen before. I learned that I could potentially see Plains Forktail (Ischnura damula), Prairie Bluet (Coenagrion angulatum), Boreal Snaketail (Ophiogomphus colubrinus), and maybe Forcipate Emerald (Somatochlora forcipata) or Beaverpond Baskettail (Epitheca canis). The distribution map of Elusive Clubtail (Stylurus notatus), however, was extremely intriguing. A slim band running across southern Manitoba appeared to be furthest west portion of its contiguous range, which runs off the map to the east (I need the eastern counterpart guide to see the full extent of its range). After that, three anomalous records with a great deal of distance between them made up the remainder, with a single record above Alberta in the Northwest Territories being the westernmost. I did a mental connect-the-dots and dared to dream. I never actually expected to find Elusive Clubtails despite letting my mind run wild with the possibility. 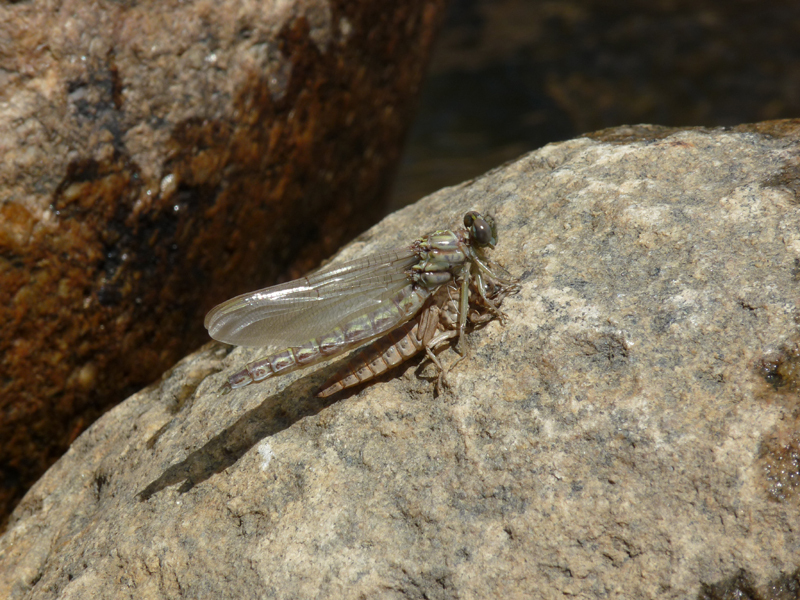 The species name alludes to its life history: after larvae in slow-moving rivers climb up onto rocks, the adults emerge from their larval casings (or exuviae), and then fly up into the forest canopy where they spend the majority of their adult life. Consequently, you have to get lucky and find them emerging or breeding. I was fortunate enough to have a low intensity day at work, which just required me to run some errands around Fort McMurray on June 30th. I took advantage of this by heading down to a section of the Clearwater River that I visited last year. The weather was quite warm, as it had been for the previous couple of days. When I reached the end of the short trail, I scrambled down some boulders to get to the river's edge and flushed up a very freshly emerged dragonfly. I looked at it with my binoculars and recognized it as a member of the family Gomphidae, and specifically thought it looked like a clubtail. I had seen my first Boreal Snaketails a couple days earlier and had no idea what a freshly emerged snaketail would look like - was this one? I snapped a couple record shots and pondered the perching posture it had taken when it landed. The dragonfly was hanging from a leaf and made me think it was not a snaketail. Rather, it appeared to belong to the genus Stylurus, also known as the "hanging clubtails". members of the genus Stylurus are called "hanging clubtails"
I proceeded to find several more individuals (approximately ten in total) and their similarity to Olive Clubtail (Stylurus olivaceus) - the only other Stylurus I have seen - was remarkable. I photographed a few more individuals, including a couple males that appeared to have slightly more mature colouration, and when I left I was quite confident it was going to be an exciting find. This male Elusive Clubtail was the most striking individual I encountered. You can see its wings still haven't fully inflated. I followed up my sighting by contacting a couple respected odonatologists and they confirmed my suspicion - these were the first documented Elusive Clubtails in Alberta! I still can't believe all the luck that led to the sighting - the weather, the location, and the timing were just perfect! Not only is this the first time I've had a provincial first record, but this species is probably the least understood dragonfly I've ever encountered. Hopefully this record can be used to build a further understanding of their range from western Manitoba over to the Northwest Territories.